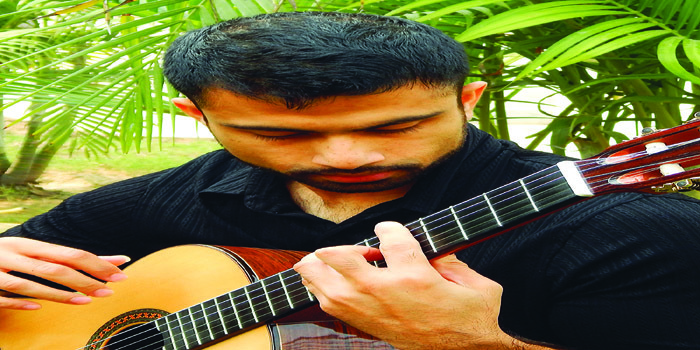 Performing here for the first time, promising young classical guitarist Yogi Ponappa shares his musical journey, emotional bond with the city, and a taster of what he has been working on for Sundaya��s International Arts & Music Society concert. Tell us about the Bangalore gig. St Andrewa��s is a beautiful space, with excellent acoustics and a great sense of peace. The programme is a selection of a�?bonbonsa�� familiar to classical music lovers. I have interspersed some pieces from the guitara��s traditional repertoire with widely known works borrowed from other instruments. This includes Chopina��s Raindrop Prelude, Schumanna��s Traumerei and some Vivaldi, as well as the classical guitar standards Tarregaa��s Capricho Arabe and Barriosa�� La Catedral. Why is this so special for you? I have always thought of Bangalore as a point of origin. Both my parents grew up in this city, and I have a lot of family here. If my mother still lived where she did as a child, she might almost have heard me from her living room this Sunday! Also, some of the wood that makes up my guitar stood a little to the south of here till some time in the 1970s, so this is a homecoming in many ways. Do you have a favourite guitar? The guitar is such a marvellous example of what humanity can build. It is, at once, both sculpture and machine. Inevitably, one of my favorite guitars is my own, for emotional reasons. As for instruments I hanker after, guitars by Hermann Hauser and Jose Romanillos are, to me, the most beautiful and best sounding in the world. More about the musical journey. I got involved with this instrument by accident, really. I was signed up for guitar lessons at the Delhi School of Music when I was eight, because my family didna��t own a piano at the time, and the school was insistent on students having an instrument to practice on at home! It didna��t take long for me to come to love my six strings, though. Through my school years, friends kept trying to get me into bands, but I could never play anything other than classical music and really mean it. Two different performances come to mind. One was in Canada, when I played something that happened to be of great emotional value to some people in my audience. The other was earlier this year in Delhi, where everything came together especially well. In both instances, having had an emotional impact on people I played for is what I cherish most. Free event. At St Andrewa��s Church, Cubbon Road. November 23, 6 pm.